Fakhamti is one of second class furnished apartments in Jeddah with suitable booking price. It is located at South of the intersection of seventy With Hera Street, Al Rabwah District, Jeddah. 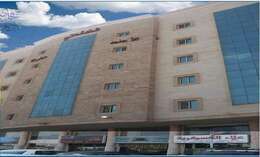 The furnished apartment is 3.1 Km driving from General Directorate of Education-Jeddah and 2.7 Km driving from Abdul Latif Jameel Hospital For Rehabilitation. With its unique location, the hotel suites offer many facilities for guests welfare such. Enjoy discovering Jeddah City by visiting some Landmarks such as: Heraa International Mall, Aziz Mall and Al Ansar Hospital. When would you like to stay at Fakamati? This apartment contain two bedrooms, the first bedroom offers large double bed and the other bedroom offer two single beds. It also include seating area with sofa and private bathroom. This apartment contain three bedrooms, the first bedroom offers large double bed and the other bedroom offer two single beds and the third bedroom offer two single beds either. It also include seating area with sofa and private bathroom. Fakhamti contains highly convenient group of units. This units contain special designs and decors and offer many facilities for guests welfare. Fakhamti offer two types of furnished units such as: Two-Bedroom Apartment and Three-Bedroom Apartment.